Bridgette Mokoena, a patient of prosthetic and orthopaedic specialist Jaco Deist, will be the first South African recipient of an i-digits™ partial hand prosthesis developed by Touch Bionics by Össur. They are set to jet off to Scotland for the procedure on the twelfth of November. This article serves to describe the technology that makes bionic prosthetics for partial hand amputees possible. Usually, upper limb amputees can choose from cosmetic, body-powered or battery-powered prostheses. Cosmetic prostheses or passive prostheses serve only as an aesthetic replacement in terms of look, fit and feel. Bridgette has explored these options after her partial hand amputation but found little satisfaction with the results of the cosmetic application. When asked about her cosmetic prosthesis she said that she did not like it because it was not user-friendly. She also added that she was not fond of the way it looked and it was uncomfortable to wear. Body-powered prostheses or conventional upper limb prostheses help patients regain some function like the ability to open and close the hand with a hook system using the same technology as a bicycle’s handbrake system. Battery-powered prostheses are also known as myolectric or bionic prostheses. These are prostheses that rely on batteries to function but provide a much stronger grip power than the aforementioned applications. The use of bionic prostheses also means that the strength the patient has retained in the residual limb is inconsequential when it comes to the way the prosthetic functions. The fingers of the i-digits™ are individually powered, making it different from the more common clamp function based prosthesis made available to upper limb amputees by battery-powered prostheses. It can be modified to suit patients who have lost between one and all five fingers on a single hand. The i-digits™ grip pattern is completely customisable and continually revised for precise control until the hand’s digits possess very close to the dexterity in human fingers. There are 32 grips available meaning the range and precision of motion is ground breaking. The i-digits™ is fitted with its form-fitting anatomical design to suit the replaced fingers. It is powered by a small battery pack that is contained in a compact wristband, along with the microprocessor. The i-digits™ is powered by a sensor on the distal residual limb which reads the cognitive signals it receives from the brain. 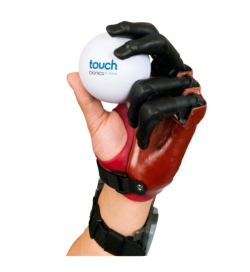 i-moTM technology enables the bionic hand to move in four directions and access the four grip options. quick grips™ gives the user access to twenty pre-programmed grips of which 12 are custom my grips™. This range of movement is unfounded and it is compatible with multiple devices and even the Apple Watch. When the sensor is triggered by a cognitive message the i-digits™ reacts by activating a specific grip function. Small Bluetooth® enabled grip chips™ allow the wearer to enter available grips by moving their i-digits™ close to where a grip chip has been placed. Bridgette sets off to receive her very own i-digits™ on the twelfth of November. We wish her and her prosthetist travel companion Jaco Deist of Deist & Associates the best of luck in taking on some of the world’s leading prosthetic technology.